Double Papasan Solid Color Replacement Cushions 48" x 62"
The Love Seat or Double Size Papasan Cushion comes in two sizes. The sizes are 48" x 62" and 58" x 78". Make your choice above. The larger papasan cushion costs a bit more. This is a papasan replacement cushion for a loveseat size Papasan, which may be considered a Mamasan replacement cushion. Simply measure across your present papasan cushion. This cushion is 48" x 62". The cushion runs between 6" and 8" thick. Papasan chairs are a comfortable fashion statement. The problem is many times the papasan chair frame outlives the cushion. FineWebStores.com to the rescue! 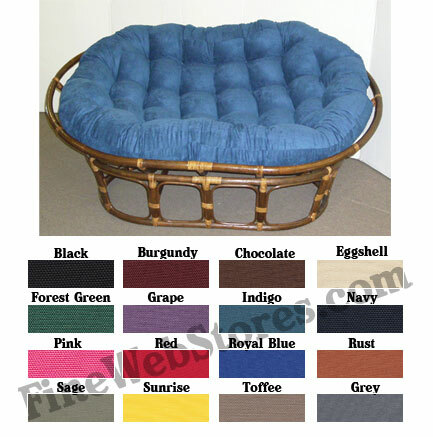 We sell excellent quality replacement papasan cushions! Our cushions are filled with soft poly fill.